August Class and Component milk prices were announced on August 29. The Class III milk price increased to $17.73/cwt from $16.68 in July, a 6% increase. The increase was driven by 5% increase in cheese and a 10% increase in butter. The size of the increase in butter was unexpected. These changes have slightly altered the make-up of the Class III milk price shown in Chart 2. 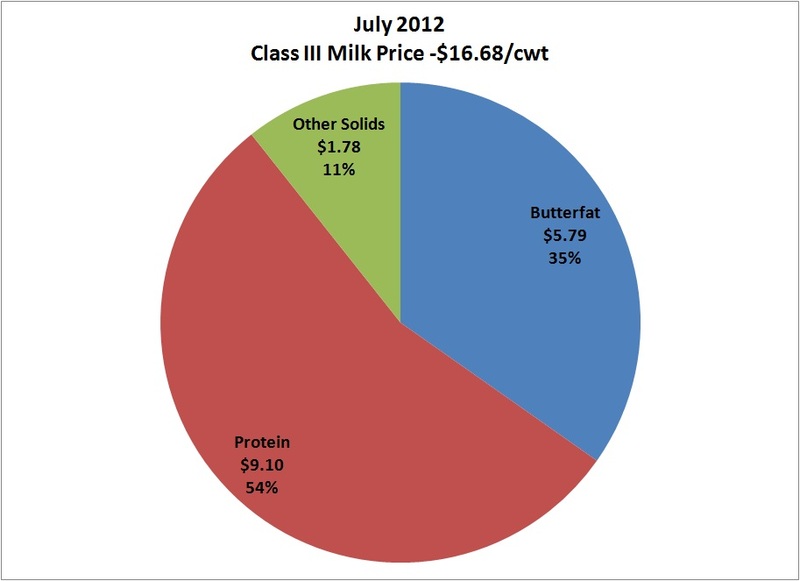 In July, protein made up 54% of the milk payment and in August, it made up 53%. While the milk protein price was up just 3% and butterfat was up 11%, it is important to note that the factors influencing the payment chart were only slightly affected. By far, the most important component for the dairy producer is still milk protein. The most important goal of the dairy producer who wants to increase revenue is to find ways to increase milk protein pounds. This typically involves an increase in milk production and an increase in milk protein percent. The long term trends remain very positive. 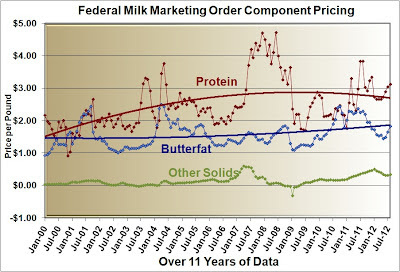 Butter increased to the level of its recent trend line as shown in Chart 3 and milk protein continued to increase above its long term trend. 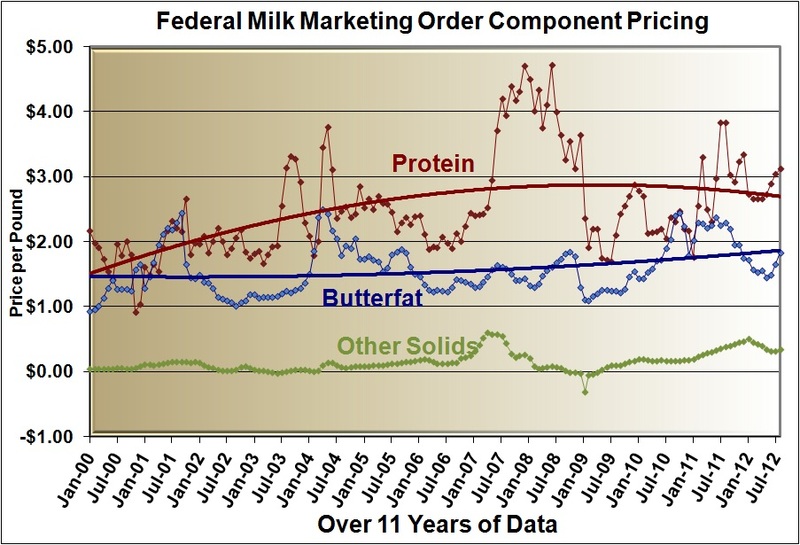 As will be discussed below, there is reason to believe that in the short term butterfat will continue to increase in price faster than milk protein. 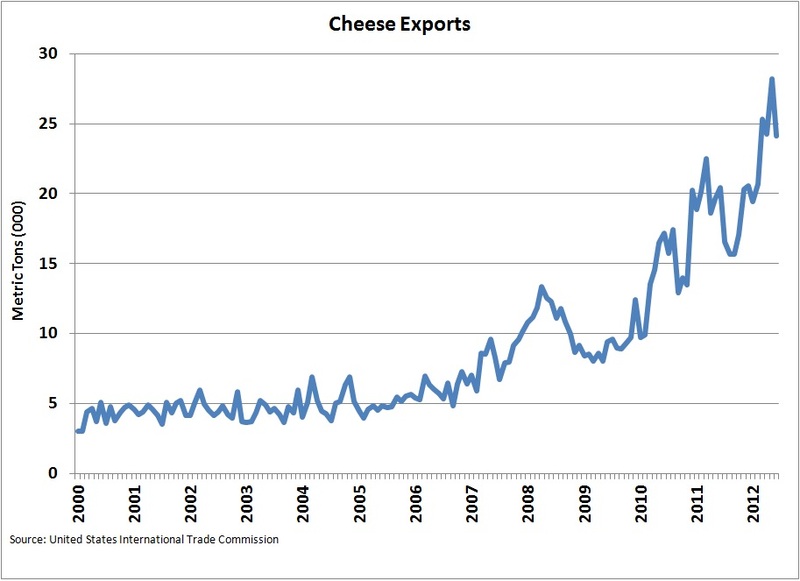 However, in the long term, milk protein prices will increase more than butterfat as both consumer consumption and exports drive higher demand for cheese. 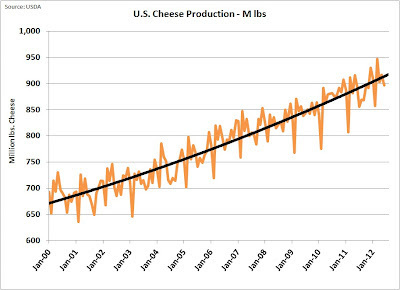 Demand for cheese continues to grow and production also continues to grow to meet that demand. Over te last twelve years, cheese production has increased nearly 40%. There is no reason to expect this trend to change. Per capita consumption in the U.S. has not reached European levels and has shown steady growth over time. 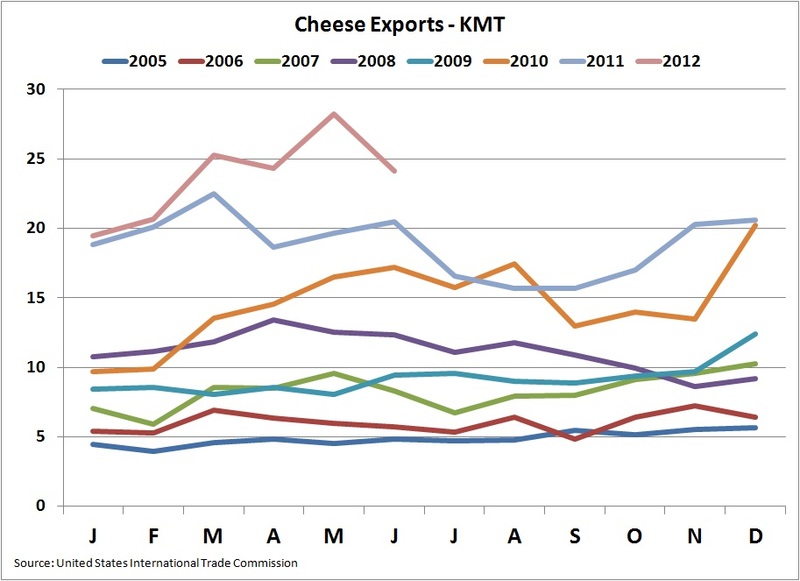 Exports of cheese remain very healthy (chart 4) with a record June export level (Chart 5). 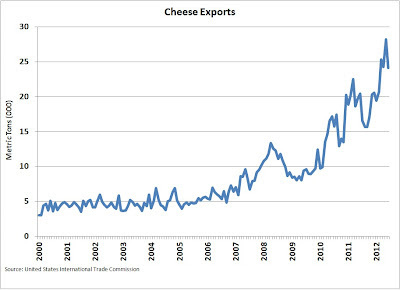 Since 2006, cheese exports have seen a very steady and healthy increase. Currently industry assistance programs are well positioned to support U.S. exports of dairy products and cheese appears to be the strongest segment of this growth. 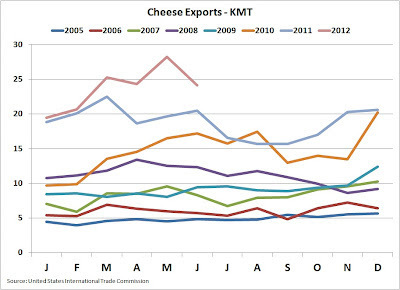 Chart 6 shows a 500% increase in the volume of cheese exports during the last 12 years. 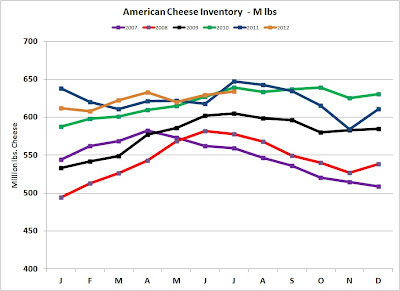 Cheese inventories are remaining in balance between production and demand. 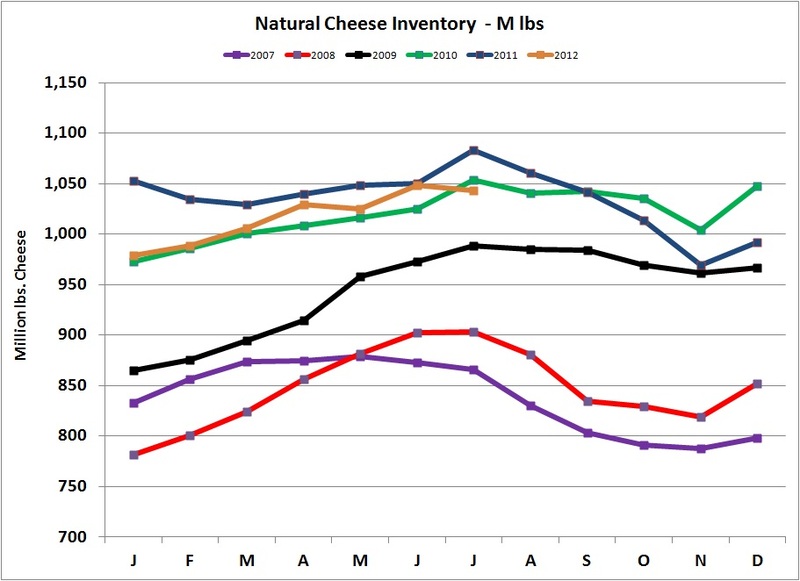 Charts 7 and 8 illustrate that there are no significant bubbles or severe shortages in cheese inventories which could disturb pricing. Growth in demand for butter has been very different for cheese. Per capita consumption has been stable with slight growth in the last eight years. Demand has developed based on population growth, a slight increase in per capita consumption, and exports. 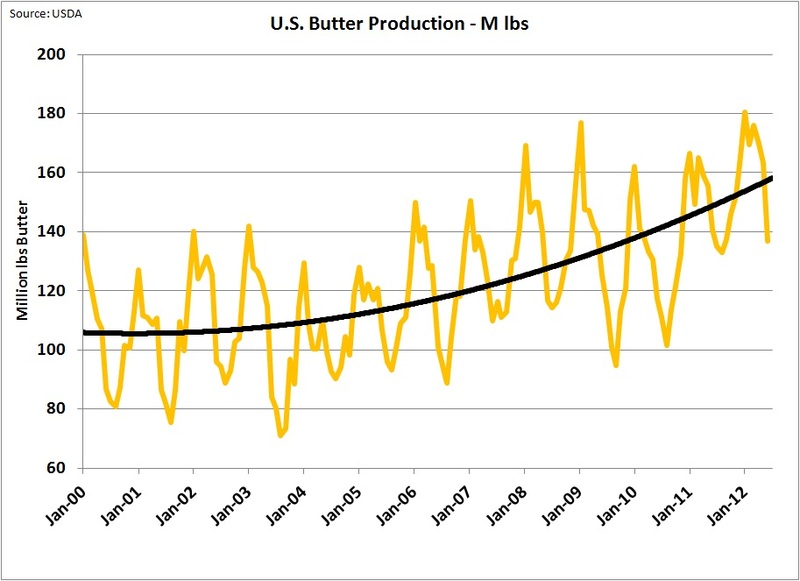 Butter production has grown more than 45% over the last 12 years. 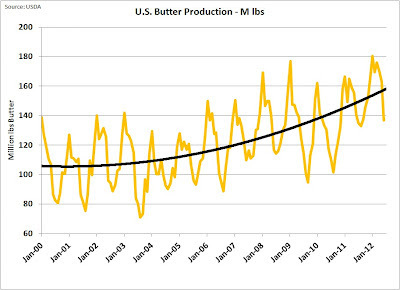 Comparatively, butter production has grown faster than cheese production. The growth is driven primarily by exports. Note the higher export levels shown in Chart 10 in 2008 required increased production as shown in Chart 9 for 2008 and 2009. 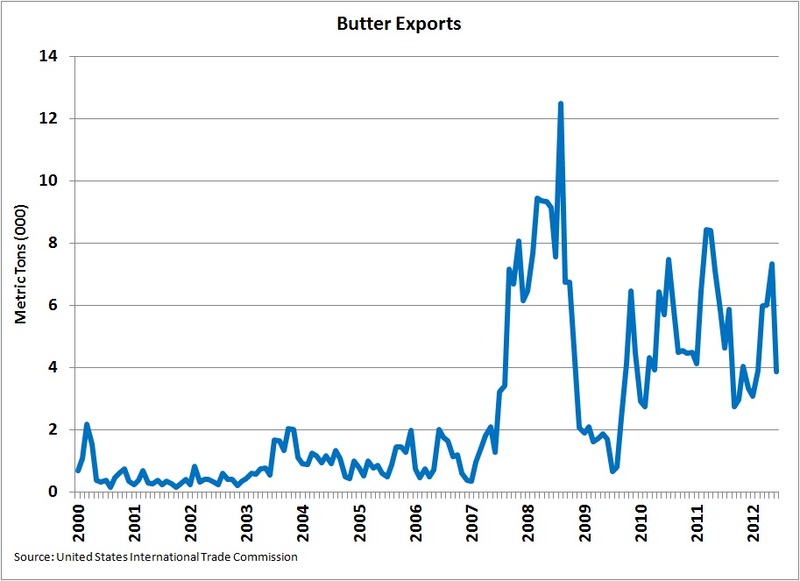 Butter exports created an inventory shortage in 2008 which was recovered in 2009 with lower exports and continued high butter production. 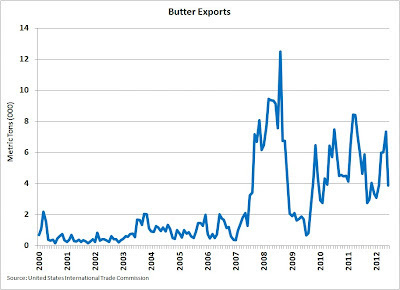 Butter has reached equilibrium in 2012. Good production and exports well below the 2008 record year let inventories return to normal levels. Recently butter inventories show a little shortage developing which is starting to have an impact on pricing. 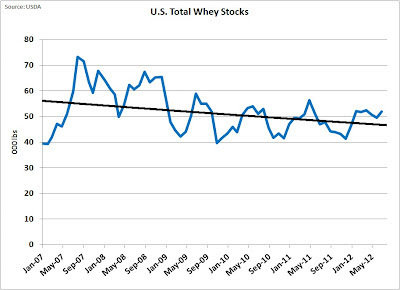 Other Solids Price = (Dry whey price – 0.1991) times 1.03. 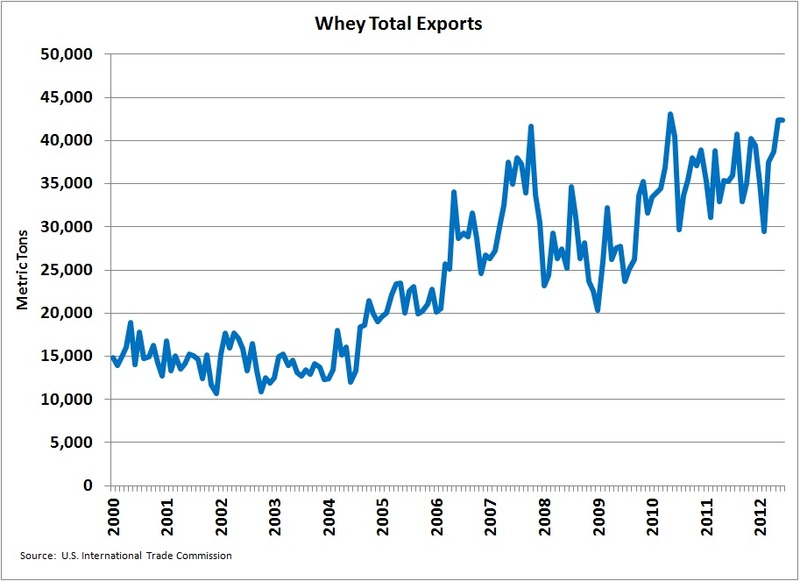 Dry whey is a major export item which has seen growth of nearly 250% over the last 12 years. 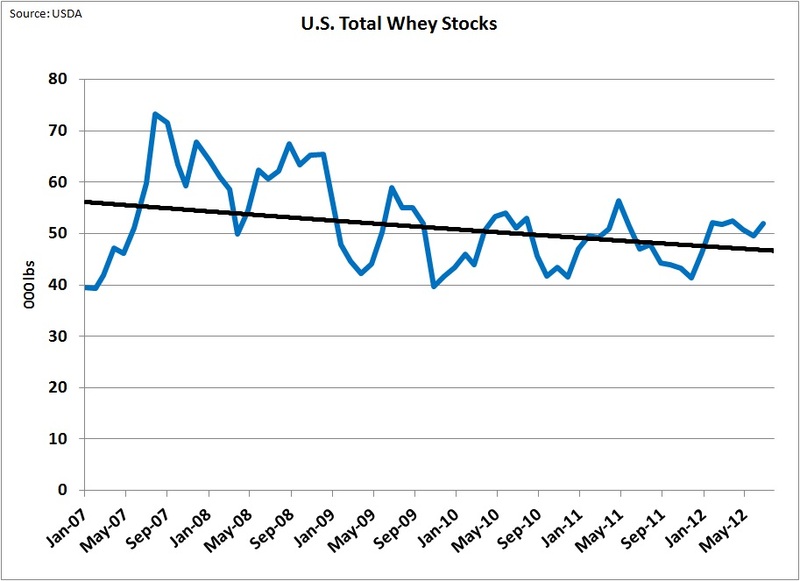 Whey inventories shown in chart 12 have been decreasing as demand has increased. Whey is a by-product of cheese manufacturing. It consists primarily of lactose and non-casein proteins. 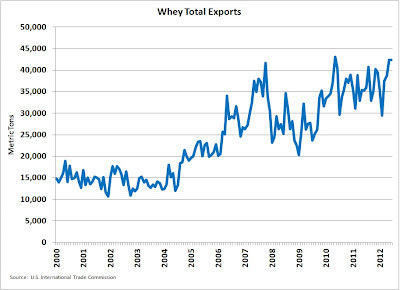 Whey is finding higher value uses and is becoming more in demand, but production is limited by the amount of cheese produced. As can be seen in Chart 3, "Other Solids" has attained a higher value in the last two years and may stay or even increase further in value as demand outstrips supply. 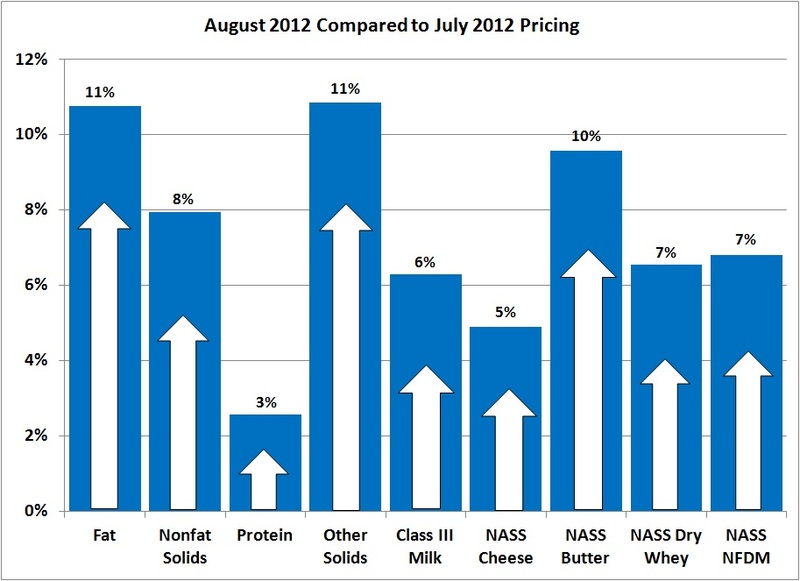 NASS cheese prices for August were $1.77/lb and butter prices were $1.69/lb. 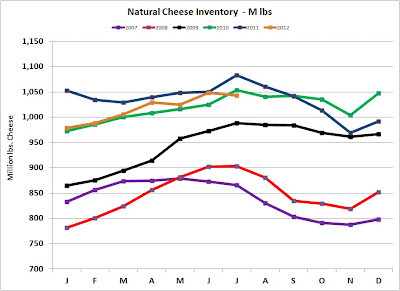 As has been demonstrated in other posts to this blog, the NASS cheese prices lag the CME by about two weeks and butter prices track very closely. 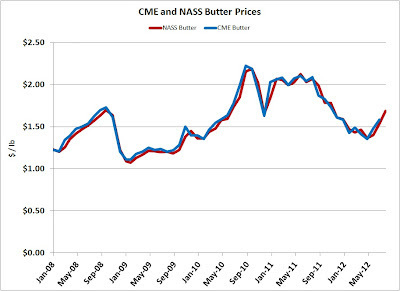 Chart 14 shows the tight correlation between CME and NASS butter prices. 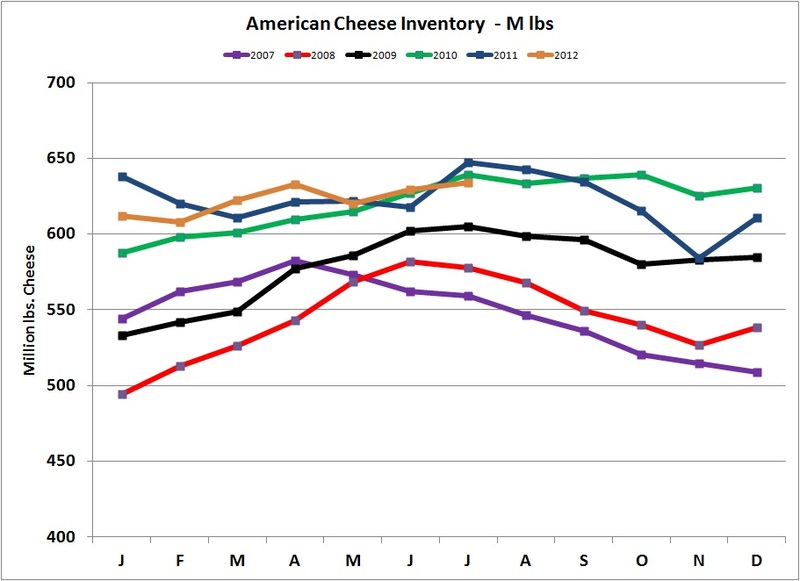 At the end of August, CME prices for cheese blocks were $1.82/lb and cheese barrels were $1.78/lb. Both were very close to the August NASS prices of $1.77/lb which is used in the milk protein pricing calculation. 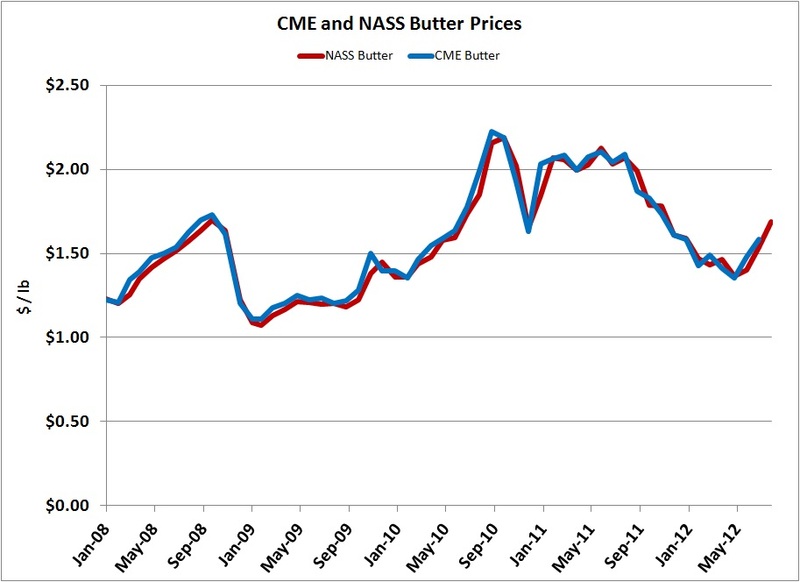 However, butter prices on the CME on the last day of August were $1.84.lb, well above the average NASS prices for August of $1.69. In the immediate future, it seems fairly certain that butter (and therefore butterfat) will increase faster than cheese (and therefore milk protein). 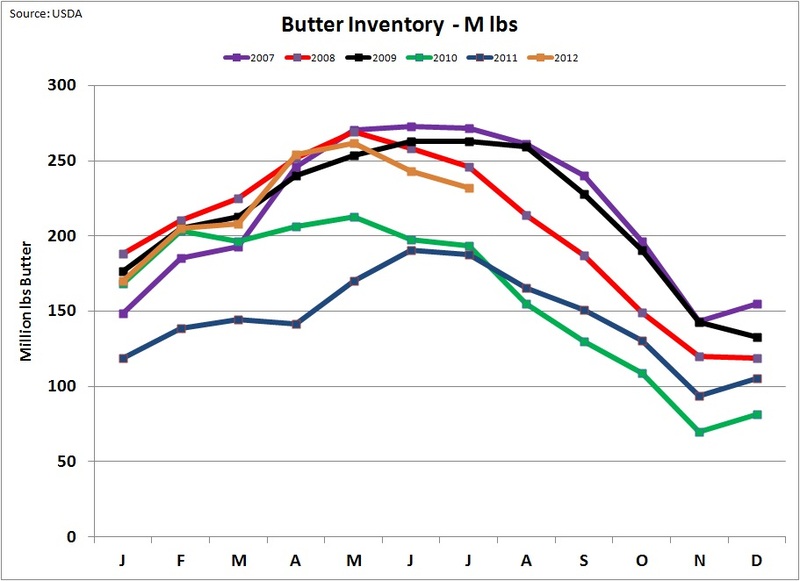 Remember that as butter increases in value, it has a positive impact on butterfat prices and a negative impact on the value of milk protein. As of the date of this post, Class II milk futures for November and December 2012 are at $19.97/cwt.